Today’s recipe is my take on a delightful appetizer made by a mysterious, black-haired, smokey eyed, Romanian gypsy who weaves her Eastern Romanian fare with Italian and Camaroonian accents. With her help, I have learned to appreciate traditional foods full of nutritional goodness. I could sit all day and listen to her stories of growing up in a Communist state. I think this would be a great dip to take to a Super Bowl party. It is called Salmon OCD Dip to help you remember why it is so good for you. Omega-3. Calcium. Vitamin D.
Put the salmon in a food processor, blender, or mini food processor. Don’t look at the disgusting mixture. Just think and repeat “omega-3, calcium, and vitamin D.” Process well. Add the sardines, capers, onion, palm shortening or bacon drippings, salt and lemon juice. (And the anchovies if desired.) Process well. Transfer to serving bowl. I prefer to serve this with fresh carrots and sliced apples. My friend served it with Belgian endive which she had separated into “boats” and arrayed on the serving platter. Lovely. Family “gustar” report: My kids won’t try it. If your kids love seafood a lot, it may go. If they don’t, probably won’t. My husband and I both think it’s great. I wish you health and hope that you will consider what intensive nutrition could do to help you attain it, even if it seems like a problem that would have NO nutritional connection. You may be very surprised. I was. 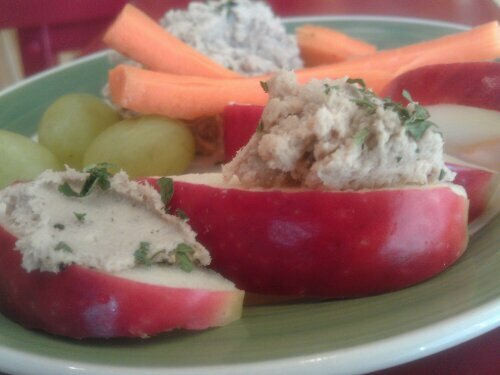 This entry was posted in Recipes and tagged appetizer, calcium, dip for the Super Bowl, GAPS, grain free, omega-3, paleo, salmon dip, sardine dip, SCD, vitamin D, whole foods on January 8, 2015 by thehomeschoolingdoctor.